Iced coffee sloshed down my front as I squeezed out of the overcrowded subway car and was swept up the stairs along with dozens of other commuters. I looked around for the stranger who doused me, but he was long gone. My mood began to darken—my orchestra placement audition was scheduled for noon, and now my audition clothes were wet and stained. I scurried down Broadway towards school, intent on cleaning myself off before finding a practice room. The cascading scale passages in the opening of Mozart’s 39th symphony were running through my head when I heard a drum beat coming from the Josie Robertson Plaza in Lincoln Center. There’s been a lot of spectacle in the Plaza the last few days because it’s Fashion Week in New York City. To us students, this means endless opportunity for people-watching: celebrities on their way to shows and fashion fanatics with neon green bobs teetering on seven inch heels. The drumbeat was joined by a flute melody, rising and turning. I glanced down at my phone to check the time, and instead my eye caught the date - Wednesday, September 11th. The sun was shining as I climbed the stairs to the Plaza. A crowd had gathered around a hundred or so dancers, their long, white garments flowing around them as they stood, erect. They were performing a slow, ritualistic march around the fountain. I recognized several of my Juilliard schoolmates among the dancers - stepping, bending, and turning. They sat on the ground and brought their hands together, palms in front of their hearts. For the next thirty minutes, I forgot about the coffee stains on my blouse as I watched the steady, deliberate movements of the dancers and listened as two singers’ simple melodies echoed and wove around each other. The sky was beautiful and blue. I didn’t know what to feel, just as, sitting here, hours later, at my laptop, I don’t know what to write. But I’m always very grateful for these moments that take us out of ourselves and remind us of how small we are, and how connected. 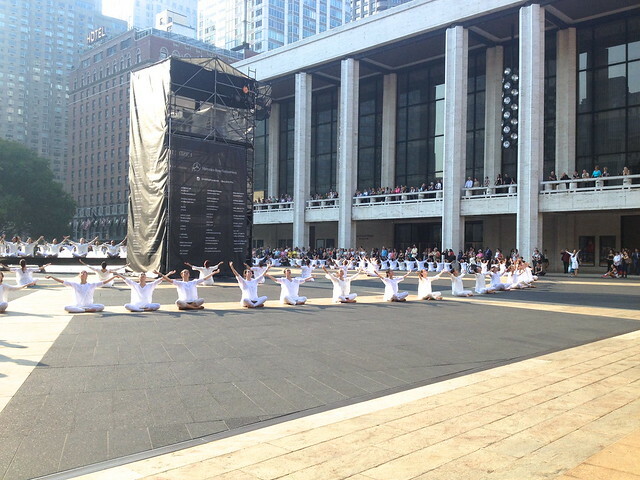 At 8:46 am, the dancers extended their arms and reached towards the sky. Then they slowly filed away, and the crowd melted too, as people returned to the sidewalks and their obligations. I walked back to Juilliard, the quiet hum of the morning filling my ears. Very well written -thank you...and it's always nice to review those sentiments which keep life in perspective.